This cabin is 15 passenger van or small church-bus accessible. Your group will enjoy 10 king size beds, 10 futons in bedrooms with king size beds, one bedroom with full size bunk beds and separate balcony and 2 sleeper-sofas. 11.5 bathrooms total. On the two big wooden decks outside you will find, rockers, picnic tables and two big, bubbling hot tubs overlook these scenic views of the Mountains. Also outside is a handy charcoal BBQ grill for cooking up all those juicy steaks and tasty burgers. The living room has two sofas and two loveseats. The stacked rock electric fireplace will keep you warm as you enjoy the big screen TV. There are two king size bedrooms - each with private bath, TV and full size futon. Upper level features a game room with a sleeper sofa and a futon, a foosball table, pool table and a big screen TV. There are four king size bedrooms - each with private bath, TV and full size futon. Also on this level is a bedroom with a full size bunk bed with TV and a separate deck. Lower level features a theater room with individual media seats and 70 inch TV and BLU-RAY player, along with a refreshment area which has a table with four chairs, wine cooler and stainless steel refrigerator. There are four king size bedrooms - each with private bath, TV and full size futon. On the large deck you will find two bubbling hot tubs that offer a magnificent view. The washer/dryer is also housed on the lower level. Very easy paved roads and access to both Pigeon Forge and Gatlinburg, the Great Smoky Mountains National Park, and Dollywood. Come see just how it feels to stay up in the clouds and you'll never want to stay anywhere else but "AMAZING VIEW MANOR". 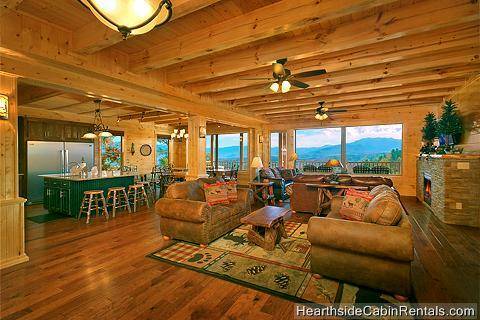 This cabin is a great choice for family reunions, weddings or church/Corporate group retreats. Cabin was exactly what we were looking for and amazing as always. Yes, I would recommend Hearthside to a friend or family member! The reservation process was seamless and the cabin was great and clean. We had a wonderful experience. Yes, I would recommend Hearthside to a friend or family member! Our Church Ministry came up for the weekend. It was an extremely great experience. The cabin was very clean prior to our arrival. Two stoves, two dishwashers and two microwaves was awesome. We have a large group with us and everyone is excited for a trip back in 2016! Yes, I would recommend Hearthside to a friend or family member! The service was great and we thoroughly enjoyed the cabin. Yes, I would recommend Hearthside to a friend or family member! Everything was incredible, great house and with our guests you all were very accommodating! Yes, I would recommend Hearthside to a friend or family member! The cabin was clean and ready for us when we arrived. Everything was wonderful. I can't wait to come visit again!! Yes, I would recommend Hearthside to a friend or family member! The view is exactly why they call this cabin "Amazing View" !!! We enjoyed every minute of our stay. Chuck was excellent with his expertise in resolving any maintenance issues and/or questions. 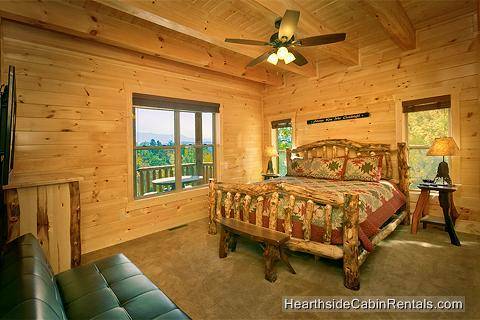 HearthSide Cabin Rentals is by far the BEST place to rent cabins in the Smokies!!! We cannot begin to say enough about our representative Denise Miller. She is ABSOLUTELY the best contact ever. She has gone out of her way to make us feel welcome! She is the reason we are repeat customers, year after year!! We have already booked our family cabin for next year!! THANK YOU.......Denise, Chuck and the office staff at HeartSide!! Yes, I would recommend Hearthside to a friend or family member! 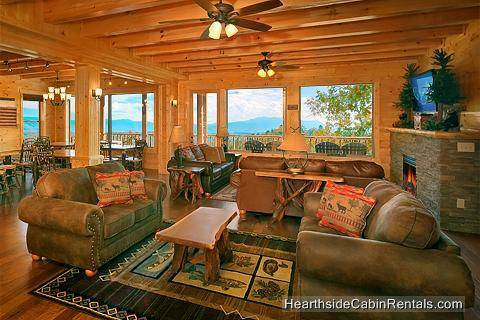 This was my first time visiting HearthSide Cabin Rentals and my family and friends had a great time! We are already planning for another trip next year and planning to stay in the same cabin that we stay in February 18-23, Amazing View Manor. Yes, I would recommend Hearthside to a friend or family member! Very satisfied. Excellent. Yes, I would recommend Hearthside to a friend or family member! Denise was wonderful to work with! The cabin was awesome! Yes, I would recommend Hearthside to a friend or family member! Cabin was spacious. We had 19 people and were not crowded at all. Everything was in great working order. We enjoyed our stay and everyone wants us to book same place again next year. Yes, I would recommend Hearthside to a friend or family member! Cabin was clean and inviting when we arrived. All personnel were friendly, helpful, and made you feel as if you were "family". We called about two or three minor problems and a service man was there promptly and took care of the minor problems. Yes, I would recommend Hearthside to a friend or family member! Everything was great our family had a wonderful time the cabin was vey clean and well kept would definitely keep hearthside in our records for future bookings Yes, I would recommend Hearthside to a friend or family member! best time we ever had terrific Yes, I would recommend Hearthside to a friend or family member! Everything was great! Our pastors had a wonderful time and enjoyed the cabin. Yes, I would recommend Hearthside to a friend or family member! Like the way the people in the office made sure we were taken care of very friendly. Cabin was nice but it could use a bigger BBQ grill and some arcade games. Besides that it was a beautiful place Yes, I would recommend Hearthside to a friend or family member! Like the way the people in the office made sure we were taken care of -- very friendly. Cabin was nice but it could use a bigger BBQ grill and some arcade games. Besides that it was a beautiful place Yes, I would recommend Hearthside to a friend or family member! I hope I am not repeating myself. :-). This was a wonderful vacation and my siblings loved the cabin. Your staff is AMAZING from Denise to the office ladies. Everyone was so helpful! Thank you for making our trip so memorable. Yes, I would recommend Hearthside to a friend or family member! Everything was wonderful and my family (siblings) loved the cabin. Your staff is AMAZING from Denise to all the office girls. Thank you for making our reunion so memorable! I would like to say we had a wonderful weekend in the cabin and like the owner said the running water was great. The shower was nice and warm and everything was clean when we arrived. My church is New Generation Church of Mobile , AL. We had our marriage retreat there .